Okay, this was too funny not to share, and my son gave me permission to show you, so prepare to smile. Like most kids, my son loves to draw. He’s got an extra dose of creative energy, so he’s always sticking pictures on the walls around the house. But this particular one is going in his keepsake box for sure! Because it’s so artistically done. And because it’s flippin’ hilarious! 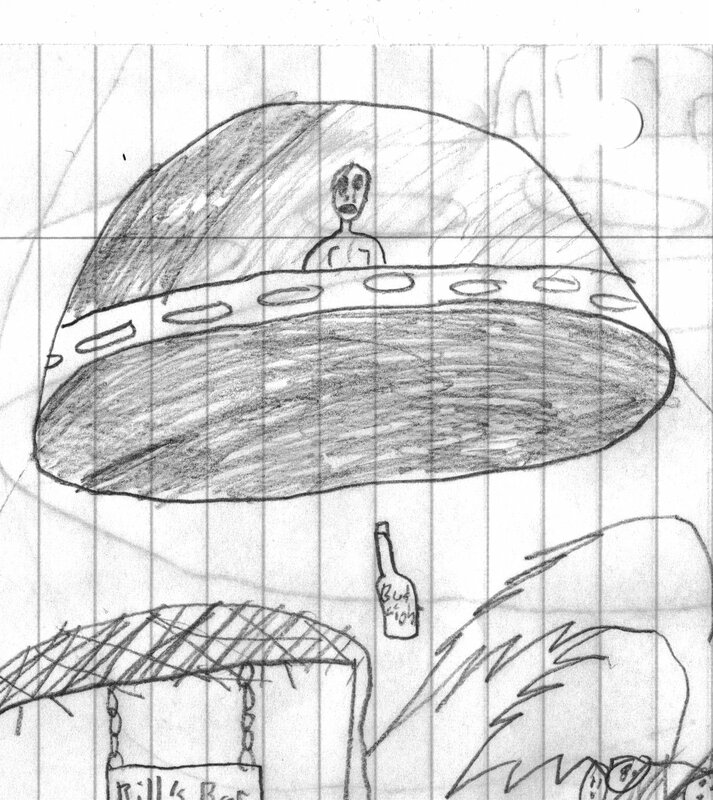 My scanner made the alien drawing on the back show through…and it’s on ruled paper, but whatever! It’s totally awesome! Okay, let’s break it down. First, notice the people running away. When we asked why the one was throwing up, Logan responded that it was because she was so scared she barfed! I can buy that. Then we wondered why the guy is shirtless. Answer: because they’re in Hawaii. Duh! Of course someone’s blowing chunks…this was drawn by MY child. 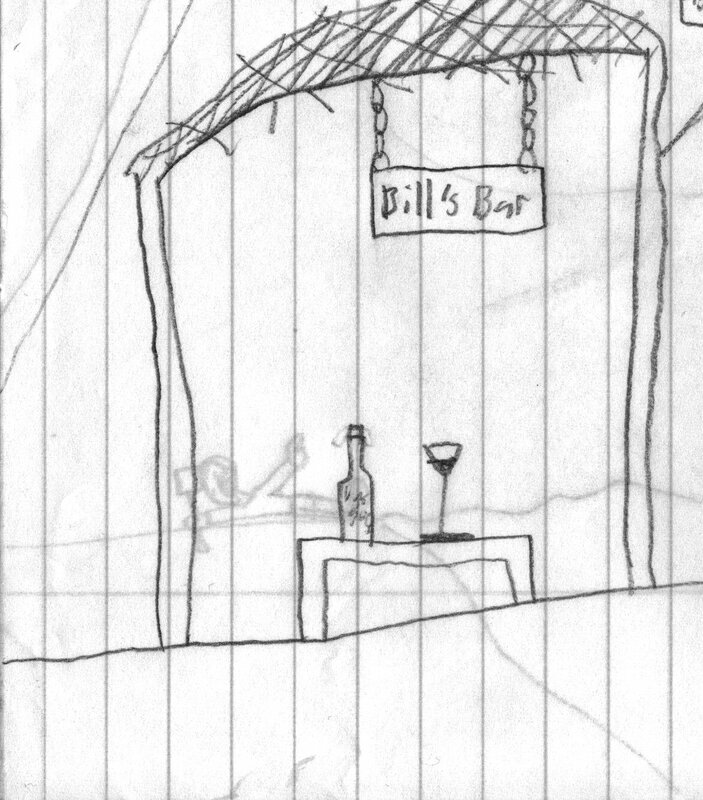 It makes sense that the shirtless dude and the puking chick were chillin’ at Bill’s Bar. I mean, that’s where everyone hangs out while vacationing in Honolulu. The faint person who seems to be lying down and pointing up is from the picture on the back, but I think it works there…just laying around at Bill’s Bar in Hawaii, pointing at the UFO (said in my best drunk-dude voice). I think that should be a postcard. And now for my favorite part. The alien is beaming up a drink. Look, folks, he’s just thirsty – no big deal! Oh, and let’s not forget the part where the beverage he is beaming up from Bill’s Bar is a Bud Light! I did a double take when I noticed that this isn’t a bottle of Mountain Dew. 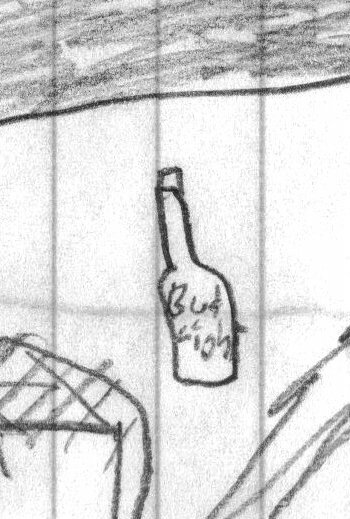 No – it is in fact, a bottle of Bud! Now, I have to say that neither my husband or I are really drinkers. We rarely have alcohol in the house and when we do, I’m not sure it’s ever Bud Light. I have come to one conclusion. This is all the NFL’s fault! Now that Logan is ten, and football is his favorite sport to play, he’s started watching it a lot on TV. And let’s face it, Hot Wheels isn’t the official sponsor of professional football. 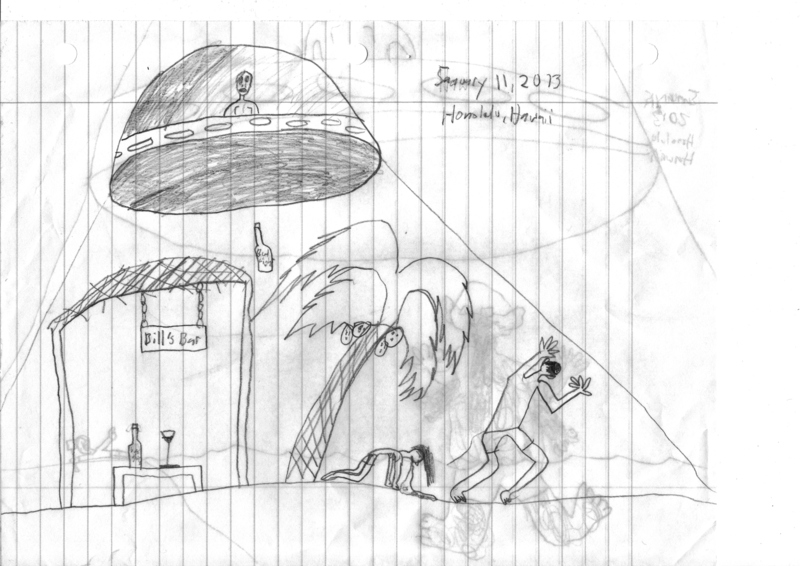 I do want to clarify that I am not particularly proud that my son created an illustration of an alien teleporting alcohol into his spacecraft (although artistically, I do appreciate his attention to detail). I am also not embarrassed by his interesting use of malt liquor. Look, he’s ten. He’s a boy. He loves watching sports. He likes to rip farts and wear the same pair of socks until they turn an unholy shade of yellow-brown. He also loves aliens – perfectly normal interests for a dude his age.